US Election 2012: It’s All About the Ground Game and Some Final Thoughts! So on this eve of this historic ( they always say elections are historic) what will determine the outcome? Will it be, as they say, who gets out the vote better that determines the outcome in 2012? I can make that statement because as a Canadian Conservative I can tell you we have been using a facsimile of that book for our successful election campaigns of the past few years. There are of course more factors than simply getting out the vote that determine an election outcome each unique to a specific election . To Wit: When the race is close there is nothing like a good old fashion hurricane to get people to stand up and take notice of their politicians. If you believe the mainstream media, the nod goes to Barack Obama for his handling of the recent crisis. However it’s 2012 and as I have said before and so have countless others people want politics done differently and the nod might go to the Republicans for the way in which New Jersey Governor Chris Christie handled Obama and the situation. People might think this is a breath of fresh air and give the Romney team some support it hadn’t counted on. If you believe what I have said about people wanting to do politics differently than you don’t have to look much farther than the stump speeches Romney and Obama have made in the last few days. Romney has made speeches that detail Obama breaking this promise and that promise while Obama touts working together with people and families. I think Obama has been saying what people want to hear lately more than Romney unless of course you believe they both have been preaching to the converted so to speak. Ironic in that earlier in the campaign Romney offered the positive vision while Obama went negative and attacked. Jobs and the economy will get people up and off the couches to vote. In the past week Obama got good news on the job front but he still broke his promise on cutting the deficit in half. Do people care? About jobs yes, about the deficit,no. What does America need right now? Bold leadership with a vision that Romney can offer. He has the experience to get the job done. I think they will get 4 more years of Obama and it won’t be quite as close as everybody thinks. Why? Because Republican VP hopeful Paul Ryan showed his inexperience and made women feel stupid with his abortion discussion during the Vice Presidential debate. Watch the exit polls on women’s voting tomorrow. They will determine the election outcome in 2012. It will be THE STORY. Posted on November 5, 2012 November 5, 2012 Categories International Politics, U.S.PoliticsTags Democrat, election 2012, Obama, Republican, Romney1 Comment on US Election 2012: It’s All About the Ground Game and Some Final Thoughts! US Election Too Close to Call! US Election: We have a Horse Race! The latest polls are showing Obama and Romney neck and neck in this coming Tuesday’s election. There is all sorts of speculation and suggestions on what could happen. As I related in an earlier post there is even talk of a split White House with Romney as the President and Biden as the Vice President. It could go down to the so-called swing states. Those states are: Wisconsin,Virginia,Ohio,Florida,New Hampshire,Iowa,Pennsylvania,Nevada and Colorado. If you live in the Eastern United States or Eastern Canada you could be up late. There are ramifications for the Canadian Economy too. The Democrats are known to be more protectionist than the Republicans. We shall see. The other thing that could have an impact on the Canadian economy are the votes regarding the legalization of marijuana. Polls show in the state of Washington,for example,that the pro pot vote might win. The great Canadian excuse for not legalizing the drug is that it would hurt relations with the US. This of course would no longer be an issue if they voted to legalize. The other thing worthy of note is the BC is responsible for a large amount of sales in Washington. This would no longer be the case as they would be able to grow their own. The impact on the BC economy could be quite shocking. All in all it will be a very interesting night. Political Insider will be there to sort through all the news. Posted on November 2, 2012 November 2, 2012 Categories International Politics, U.S.PoliticsTags Barack Obama, Democrat, Marijuana, Mitt Romney, Republican, US Election 2012Leave a comment on US Election Too Close to Call! Biden: Even when the Democrats lose we win! The debate tonight was once again close and this and Obama won on experience but Romney held his own and showed calm cool leadership when he was on the hot seat. The Obama record is mixed and Romney and company have very little experience on the foreign policy front. In the series of debates Romney bested Obama on the key questions of Economy and leadership. This election is too close to call which in itself is a shock given how far ahead poll wise Obama was at one point. Interestingly enough if the votes in the electoral college turn out to be tie, there is a scenario making the rounds that could have Romney as the President and Biden as the Vice President. If the republicans kept control of the house and the Democrats kept control of the Senate, Biden would get to vote himself as VP under ans Electoral College tie of 269-269. Can you imagine the log jam and mess the US would be in if that happened? Posted on October 22, 2012 Categories U.S.PoliticsTags Barack Obama, Debate, Democrat, joe biden, Mitt Romney, Republican, US Election 20125 Comments on Post Debate Reaction ! Foreign Policy-The Final Presidential Debate! National Security Will Be Front and Center Tomorrow Night! Tomorrow night is the final presidential debate. It is strictly about foreign policy. It is a chance for both candidates to spell out their vision on that topic. Obama in particular has been hammered for not spelling out a vision for the country,let alone foreign policy. This is important because national security, which is part of the foreign policy debate, is front and center on voters minds with all the goings on in the middle east. Romney/Ryan have little experience in this area while Obama’s record is mixed. Obama, if you recall, took out Osama Bin laden but has fumbled of late dealing with such issues as Iran,Syria ans the recent terrorist attack in Libya. This past weekend Obama was hammered by the Romney people for the ‘leak’ regarding the apparent negotiations with Iran ( Iran eventually said the talks were a croc because they were not prepared to negotiate with anybody in the US on the eve of an election). With the latest polls showing the race to the White house more or less even, tomorrow’s debate is shaping up to be the event that could decide the election. Posted on October 21, 2012 Categories U.S.PoliticsTags Barack Obama, Debate, Democrat, Mitt Romney, Republican, us, US Election 201213 Comments on Foreign Policy-The Final Presidential Debate! The Presidential Debate-Round Two-The Outcome! One was more likeable, One would manage the economy better.Who would you vote for? Depends on whether you believe the CNN polls on who won the debate tonight or whether you believe that the poll within the poll tells the true result. The Overall poll result is 46% of the people believe Obama won versus 39% for Romney. Gotta leave the Obama people feeling pretty good eh! Not so fast. Obama was awful in the first debate and anything a little better would propel his numbers upward. He gets credit there. In November when Americans cast their vote in the only poll that matters they will be looking for two things as most people do in elections. They are leadership and the economy. ( Think Harper Harper Harper if you were watching the least Canadian election) . These two factors will stand out even more in the US next month given where the world economy and the US debt-load is. Romney won by 4% on who would make the best leader ( I hear people screaming that the margin of error makes that a tie, I say who says the margin of error always has to go the way of the loser). On the poll within a poll that really matter Romney blew Obama away. He won by 18% on which candidate will be able to manage the economy. If I was running the Republican ad machine I would get the commercials rolling. ” When it comes to your food,job,house taxes and lively-hood Mitt Romney trumps Barack Obama hands down” or something to that effect. When people go to the polls they are not voting for the most likeable guy, they did that the last time and look where it got them. They are going to vote for the candidate that will protect their wallet. Tonight 18% more said that it was Romney. Posted on October 16, 2012 Categories U.S.PoliticsTags Barack Obama, Debate, Democrat, Mitt Romney, Republican, US Election 2012Leave a comment on The Presidential Debate-Round Two-The Outcome! Presidential Debate Tomorrow-The Set Up! Romney: Is that all you got Obama? To set the table for tomorrow nights debate one only has to look at the weekend polls to see what is riding on the outcome. Essentially we now have a presidential horse race where even the potential votes in the so-called swing states are showing the two contestants neck and neck. This is surprising to some because Obama was so far ahead on the eve of their first debate. We then had the Vice Presidents debate which by all accounts was a tie. This brings us to Tuesday nights debate where voters,pollsters and pundit will be watching with baited breath. What needs to happen to break the tie? 1) Romney has to keep up the attack on the Obama record and show the electorate why he is the best leader to put their hopes and dreams with. 2) Obama has to awaken from his coma. If you recall he sat back in round one and let Romney bring the fight to him.He has to state very clearly what his vision for the country is for the next four years. 3) As this is a town hall type debate both candidates will take questions from the voters. This is where Obama usually excels and Romney does not. Obama has a history of being better able to interact with the voters where as Romney tends to be a little gaffe prone. This should be an interesting night! My feeling as I have said before is that Obama’s heart is not in the job and if it were up to him he would quit. If Romney brings it to him professionally and aggressively look for Obama to sit back and give up. If I were on team Democrat I would be worried. Posted on October 15, 2012 Categories U.S.PoliticsTags Barack Obama, Debate, Democrat, Mitt Romney, RepublicanLeave a comment on Presidential Debate Tomorrow-The Set Up! The VP Debate: Who Won? 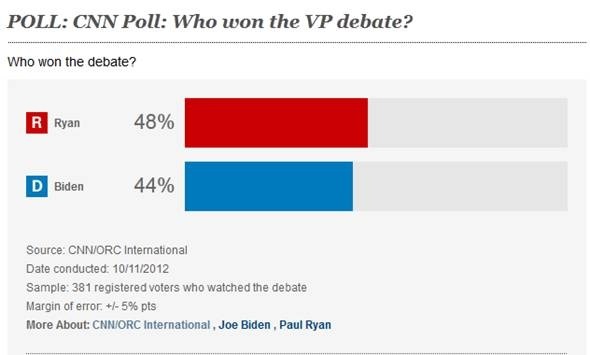 The CNN poll released after the debate showed the numbers to be Ryan 48% VS Biden 44%. Given the margin of error a virtual tie. 1) Paul Ryan did a great closing that will resonate for weeks to come. He took leadership,said he would be held accountable and not run from the tough decisions that any administration will face in the coming years. He also asked for the vote. 2) People are sick of old style politics and Joe Biden kept interrupting and cutting Ryan off. 3) Most important is this; people want a positive future and Ryan gave them that. I believe this will count big time later on in November when people actually make their voting decision. Still Biden didn’t lose any immediate ground like Obama did last week. This debate puts the pressure squarely on the shoulders of Barack Obama in next weeks second presidential debate. He can’t afford to lay another egg. I suspect he will. He doesn’t want the job. I think and I have said before, in his eyes 4 years are enough. 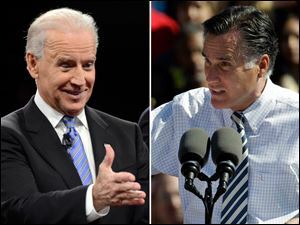 Posted on October 11, 2012 Categories U.S.PoliticsTags Debate, Democrat, joe biden, Paul Ryan, Republican, US Election 201215 Comments on The VP Debate: Who Won? Tonight’s VP Debate: The Set Up! Ryan: I can’t believe he just said that! This debate tonight is a must win for both! The Obama Biden Democrats need to win because Obama took a hammering both in the presidential debate and the polls that followed. For the Romney Ryan ticket they need to win to keep the momentum going. For the Biden folks, he must be aggressive and go to Ryan without causing any of the gaffes he is famous for. For Ryan he can’t look boring ala his rival Obama in the last debate. He must come off the guy next door. Who has more at stake tonight? Obama Biden, two hammerings in a row and their campaign goes into a tailspin. I will be back with post-debate discussion tonight,stay tuned! Posted on October 11, 2012 October 11, 2012 Categories U.S.PoliticsTags Biden, Debate, Democrate, Republican, RyanLeave a comment on Tonight’s VP Debate: The Set Up! Barack Obama Laid an Egg in the First Debate Tonight! First Debate: Obama Lays an Egg! A CNN poll after the debate tonight showed 67% of the people polled ( registered voters I should add) gave the win to Mitt Romney. In every category,taxes, health care etc. Romney handed Obama his head. More shocking than all that, the talking heads on liberal leaning CNN also said Romney “Out Obamad Obama”. it’s not often even former Clinton Campaign manager James Carville gives in and says his team lost. It was obvious that Obama wasn’t at his best and Romney was. It seemed that Romney had better knowledge of the facts and was able to attack the President on his record. Obama rarely went on the attack and in fact I thought he looked like he had aged about 20 years since the last election. It will be interesting over the next couple of days to see the polling done in the swing states. Did Romney pick up some ground? What do you think: Was this debate a game changer? Posted on October 3, 2012 October 3, 2012 Categories U.S.PoliticsTags Barack Obama, Debate, Democrat, Mitt Romney, Republican6 Comments on Barack Obama Laid an Egg in the First Debate Tonight!